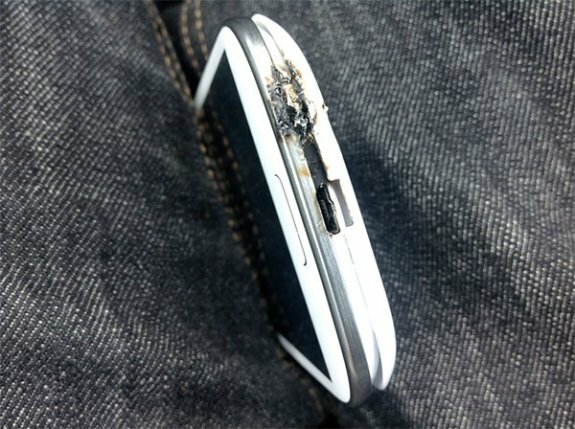 Remember that exploded Samsung Galaxy S III smartphone from a couple of weeks ago? Turns out Galaxy S III owners have nothing to worry about, UK-based third-party fire damage testing firm Fire Investigations investigated the device and discovered that microwave energy is to blame for the incident. After reading the results of the probe by Fire Investigations, the owner of the phone admitted online that someone dropped the phone in the water and tried to dry it by putting it into a microwave. After publication of the FI report's conclusion by Samsung this past weekend, the poster of the original snaps admitted online: "The damage to the phone was caused by another person, although they were attempting to recover the phone from water… It occurred due to a large amount of external and there was no fault with the phone." Reading between the lines of the FI report and the response: someone put the phone in a microwave to boil away the water that had penetrated the casing.